Vegetarian Hot and Sour Soup Recipe is hot spicy soup flavoured with some spices,sauces and vinegar.In winters we all wants a hot bowl of soup.This Veg Hot and Sour Soup recipe is perfect for winter season, Hot and Sour Soup can keep you warm and it’s healthy too.Hot and Sour Soup is spicy,tangy and had lots of vegetables. Vegetables are the main component of soup dishes.During winter season there are certain vegetables easily available in the market that can warm up your body. 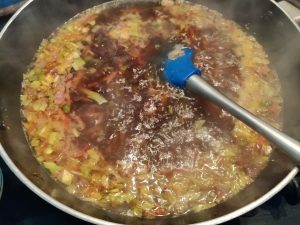 In Veg Hot and Sour Soup recipe you can add as many vegetables as you like for ex- mushrooms, cabbage, carrots, spring onion and beans. Some people also adds bamboo shoots and bean sprouts too. You can add any vegetables of your choice, Here I also added some grated paneer pieces to give a soup a rich look. 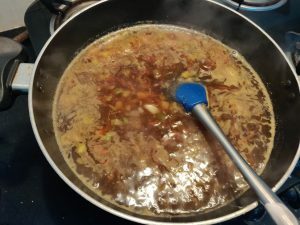 Hot And Sour Soup Recipe is loaded with lots of healthy vegetables, which not only filling your stomach, but also much beneficial for your body too. 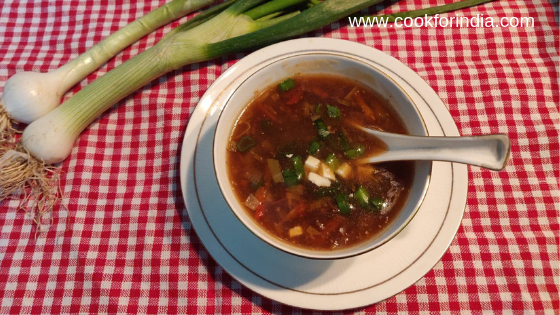 Hot and Sour Soup Recipe is one among which is liked by all and especially by vegetarians.It is soupy, tangy flavour and has a wonderful smell of sauces,vinegar and spices. Veg Hot And Sour Soup is healthy, nutritious and great in taste.A homemade Hot and Sour Soup is healthier, cheaper and delicious to taste. 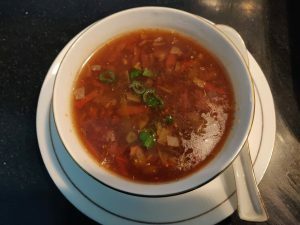 For making this flavourful Hot and Sour Soup recipe I used carrots, cabbage, beans, onion, ginger, garlic, spring onion leaves and some sauces, black pepper and vinegar..In winters it keeps the cold away and give relief for those suffering from sore throat. 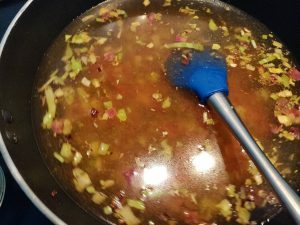 Here I make Vegetable Hot and Sour Soup recipe, this recipe is from indo- chinese cuisine.In Hot and Sour Soup recipe I also add some corn-flour which helps to thicken the soup. 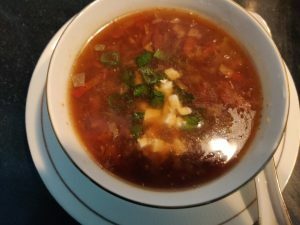 Vegetarian Hot and Sour Soup Recipe is very easy to make at home. This easy and delicious recipe can be made without applying much efforts. This tangy and mouth watering Hot And Sour Soup can be served with or without noodles. 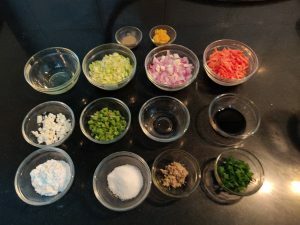 Here I shared step by step photo recipe to make hot and sour, spicy,vegetable soup from Indo – Chinese cuisine. 1.First Wash all the veggies and wipe them with wipe cloth. 2.Now finely chopped all the veggies or grate as you like. 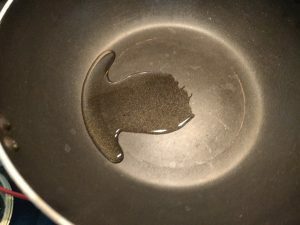 3.Heat one tbsp of oil in a wok. 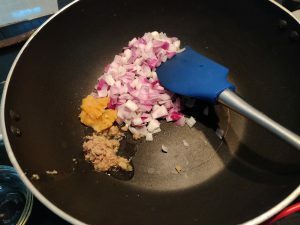 4 Add finely chopped ginger garlic and onions and stir fry for 2 minutes. 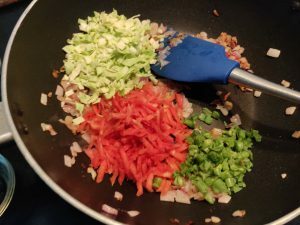 5.Now add finely chopped beans, carrots and cabbage, stir fry for 2 minutes on high flame. 6. Add water and stir completely, let it boil. 7.Now add soya sauce and salt, keep a check on salt, as soya sauce already had a lot of salt. 8.Let the soup simmer on medium flame for 8 minutes. 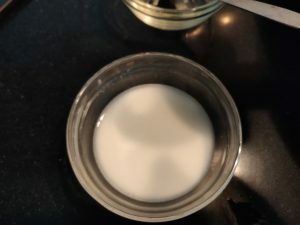 9.Add corn-flour dissolve in 2 tbsp of water and stir well till boil. 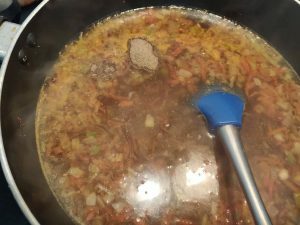 10.Allow soup to be thicken as required consistency. 11. Now add black pepper and vinegar. 12.Stir all well,off the flame. 13.Serve Hot and Sour Soup steaming hot, Garnish with chopped spring onion leaves and paneer. Enjoy your favourite Hot and Sour Soup. You can add vegetables of your choice like mushrooms, bamboo shoots etc. 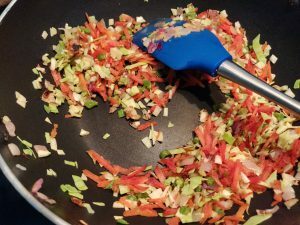 You can chopped the veggies as you like, small, bigger, grate or you can slice them as well. You can serve Hot And Sour Soup as a starter or you can have it on any time of the day.